Wordperfect Lightning is a free to download editor. Its pretty simple editor compared to ms-word. But is very fast and has new features for todays office user. 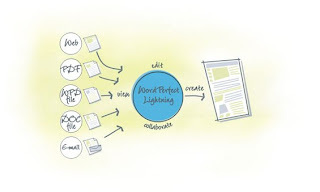 Corel® WordPerfect® Lightning™ is free software that makes it easier than ever to capture, use, and reuse ideas, information and images. It helps you perform your most common tasks simpler and faster! Find out what ‘Navigator’, ‘Notes’, ‘Connector’, and ‘Viewer’ will do for you. Start your Lightning experience!